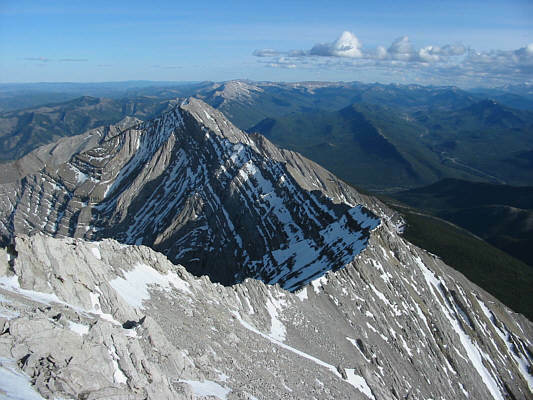 Taking a cue from Dave Birrell via Gillean Daffern's Kananaskis Country Trail Guide (Third Edition, Volume 2), I made a second attempt at scrambling up Mount Head on 21 May 2005. Starting from Highway 541, I hiked north over Grass Pass and continued along the old road before turning up the tributary branching west from Wileman Creek at GR706899. On my previous attempt about a month earlier, there was still a lot of snow in this valley which made travel quite slow and difficult (running short on time, I eventually turned around at about the 2000-metre level). With most of the snow gone this time, route-finding was a lot easier, and I progressed up the valley much more quickly. After passing the first obvious drainage coming down from the northeast outlier of Mount Head, I began climbing steeply up through the trees. 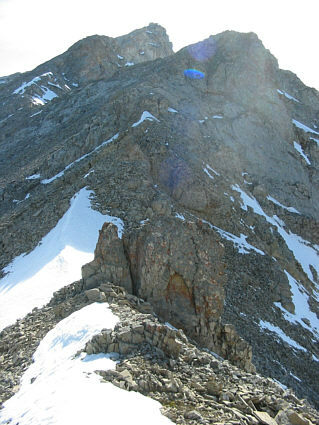 Above tree line, I contoured around the upper bowl aiming to reach the crest of the northeast ridge just west of the middle bump (see route photo below) between the summit and the northeast outlier. Although I saved myself some needless elevation gain and loss by not going all the way to the top of the northeast outlier, the route I chose is basically a big sidehill scree bash of the worst kind, and I probably would have made better time if I had gone the other way. 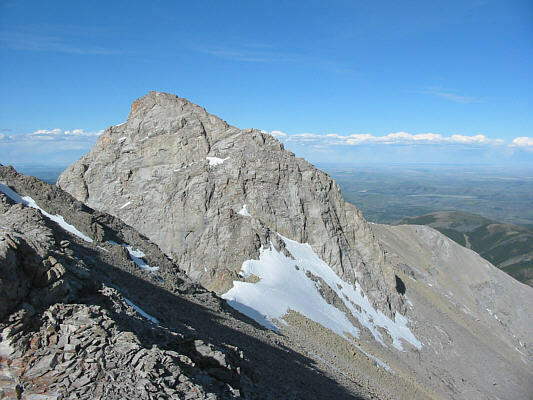 Nevertheless, I endured about 2.5 hours of miserable stumbling before I finally reached the crest of the northeast ridge. From there, the route to the summit is quite straightforward, and I topped out a little over 6 hours after leaving my car. 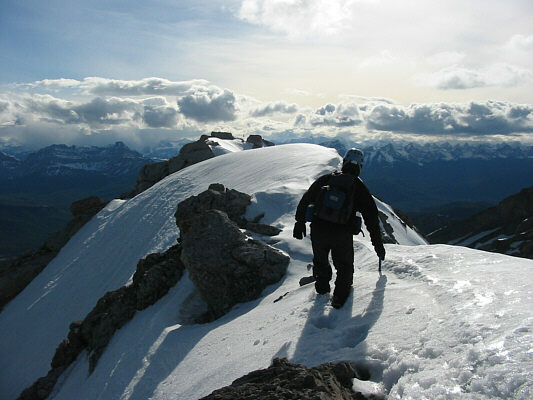 I essentially retraced my steps for the return trip, and though I saved a bit of time glissading snow patches in the upper bowl, the descent back into the valley was just as tedious as the ascent. It was getting dark by the time I regained the old road at the mouth of the valley, but all difficulties were behind me as I hiked back over Grass Pass to Highway 541. My round-trip time was less than 10.5 hours. 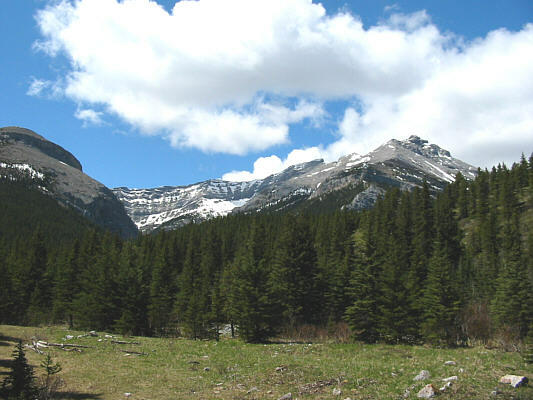 This is the view of Mount Head from Grass Pass. 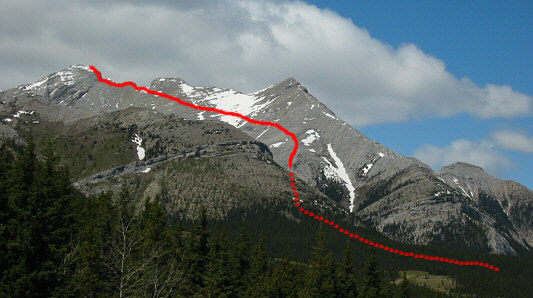 Sonny's approximate ascent route is shown. This is where the tributary of Wileman Creek branches west. There are some good game trails in the trees at left. The upper bowl reveals itself at tree line. From this vantage point in the upper bowl, the summit (knob at left) is still a long ways off. Sonny steadies himself on the loose rubble. 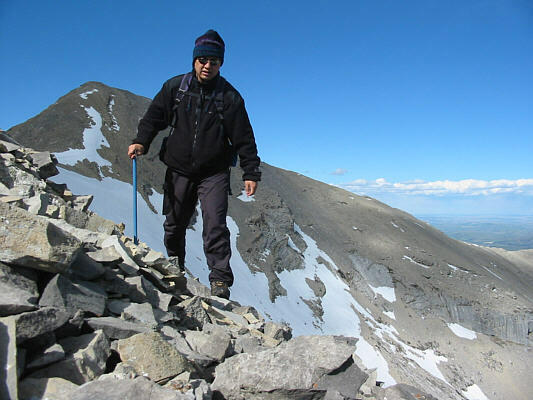 The northeast outlier of Mount Head is visible behind him. 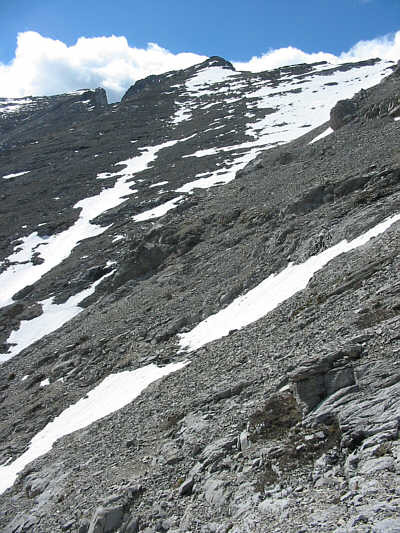 This is looking up at the remainder of the route from the crest of the northeast ridge just west of the middle bump. The west side of the middle bump looks rather intimidating. Sonny carefully crosses a lingering snow cornice on the summit ridge. 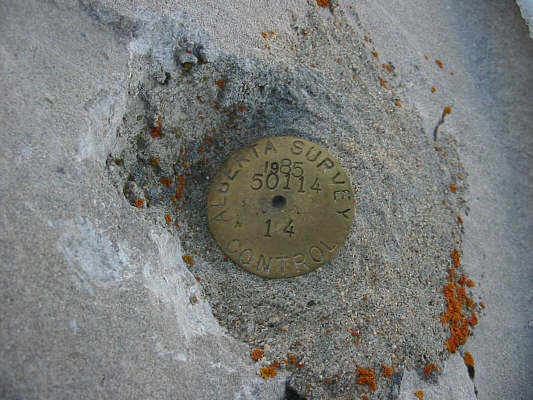 This is the survey marker at the summit of Mount Head. 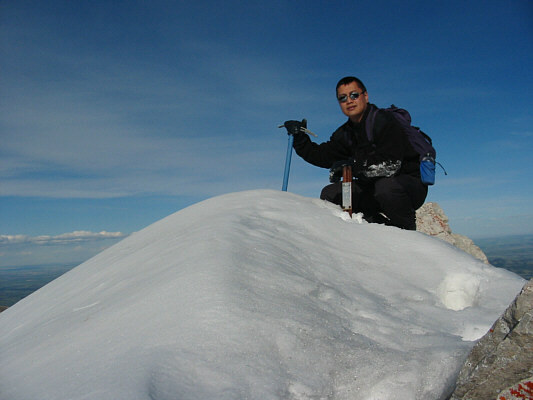 Sonny grasps both his ice axe and the metal pole on the 2782-metre summit of Mount Head. 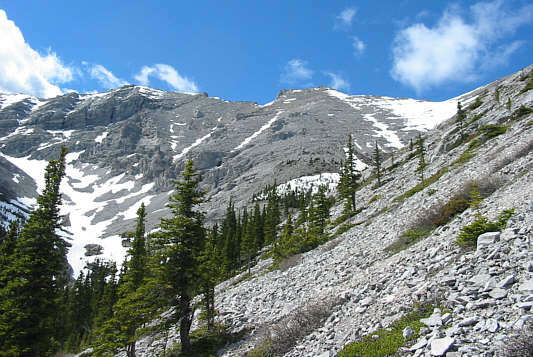 This is the connecting ridge to Holy Cross Mountain. 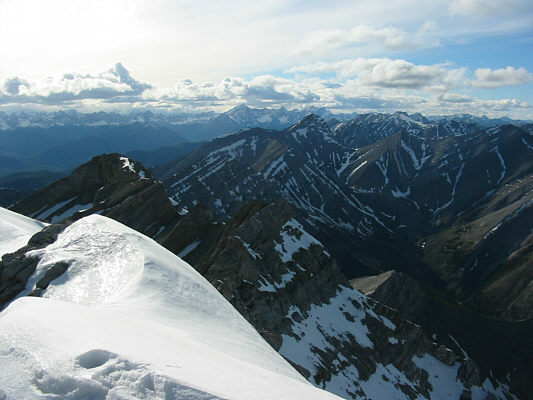 The view to the northwest features Mist Mountain and Mount Rae on the far horizon.